Overhangs are a fading architectural feature in modern Florida housing. In the original "Cracker" homes built at the turn of the century before air conditioning, wide porches and deep overhangs were considered essential to beat the heat in Florida. But with the advent of air conditioning, many new homes have sacrificed overhangs in interest of first costs. Modern developments often have next to no overhangs on new residences. But what saves initially doesn't always save over the long run. Overhangs are one of the architectural differences between the two homes in the Lakeland project. The PV home has a 3 foot overhang around the perimeter of the building (Figure 2)while the standard home has one and a half foot overhangs. 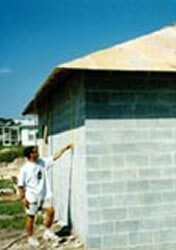 The four figures on the right show the difference an overhang can make on our project homes. 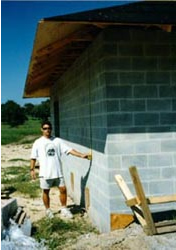 In the photos, FSEC engineer John Sherwin measures the length of the overhang shadow along the south wall of the two homes at 11:10 AM on October 1st, 1997. The standard home, shown in Figure 1, with 1.5 foot overhangs shows a shadow length of just 36 inches— barely enough to reach the tops of the window. At the same time, the shadow on the PV home, shown in Figure 2, is 72" long which a perspective photo shows covers over 75% of the south and east windows as well as much of the wall. Everyone in Florida knows that unshaded windows can really heat up the interior. The three foot overhang in the PV home is just a small improvement which we made using a very old idea to achieve better performance.